Montgomery Field could be in for some new construction, but it won't be for people. Landing planes on a cloudy day takes some extra help, and pilot Mike Rawluk said that's where technology comes in. "If you're above the clouds, you want to get through the clouds, you're going to need some kind of system," he said. The system Rawluk and other pilots at Montgomery Field use is called the Instrument Landing System, or ILS. A key part is just west of Runway 28 Right, a critical location for guiding planes in. It's in a secure area, but it couldn't keep a tiny culprit from getting uncomfortably close. The airport is filled with claylike soil, and that soil doesn't hold steady when it gets wet. The rain was taking a toll on the ILS, and in 2009, the soil under it started to give. Water collected, and that disrupted the signal. The city built a temporary structure above the water, but it rained more in 2010. That compromised a signal again. All the while, a vernal pool formed below the ILS, and the endangered, tiny fairy shrimp moved in. The FAA declared an emergency. "I've seen coyotes hanging out near the runway; I've seen all kinds of different wildlife," said Rawluk. In 2011, the city built a permanent antenna, grading and filling the area. The shrimp got the boot, but the city is now teaming with the U.S. Fish and Wildlife Service to build the tiny creatures a new home a little farther away from the runway. A city spokesman said it's too early to have a project cost, but that the airport wants to hire a full-time biologist to help with the new habitat. "If they're fans of aviation, I guess they're going to be some lucky shrimp," Rawluk said. They'll have a good view, but won't be close enough to cause any jumbo problems. The pilot of the tailwheel equipped airplane reported that his approach to landing was faster than normal. He further reported that after the airplane bounced on touchdown he elected to abort the landing, but reported that it was too late because the airplane was at the end of the runway and impacted a fence, and nosed over. A review of recorded data from the automated weather observation station located about 4 miles to the east, revealed that, about 20 minutes after the accident the wind was 180 degrees true at 11 knots, visibility 10 statute miles, and sky clear. The airplane landed on runway 03. The Federal Aviation Administration has published the Advisory Circular (AC) 91-79A. This AC discusses the effect of a tailwind on landing distance and states in part: The effect of a tailwind on landing distance is significant and is a factor in determining the landing distance required. Given the airplane will land at a particular airspeed, independent of the wind, the principal effect of a tailwind on operational landing distance is the change in the ground speed at which the airplane touches down. The pilot's failure to attain the proper touchdown point and the airplane's subsequent impact with a fence during an attempted aborted landing. EAST GRANBY— A father and son were not injured when a small private airplane crashed Wednesday night not far from the runway at the Simsbury Airport as it prepared to land, fire officials said. The two, Ralph Jones and Tucker Jones, refused medical treatment when emergency responders arrived at the crash feet from Wolcott Road, according to fire officials. The plane came to a rest upside down in properly owned by Imperial Nurseries just north of the airport. Simsbury police officers and volunteer firefighters were originally called to the are about 7 p.m., However, it was determined the plane crashed on the side of the road in East Granby, state police and East Granby firefighters were brought in, officials said. Federal Aviation Administration records, the aircraft is a 1947 Piper PA-12 owned by a man from New Jersey. Records show the plane is registered to Ralph Jones of Oldwick, N.J.
East Granby fire officials said that a member of the FAA safety team was also scene Wednesday night. The quiet airport remained open while the firefighters and police investigated the incident but no planes were seen coming or going. The road also remained open, prompting drivers to slow and take pictures of the plane as they passed. At about 8 p.m., officials said the scene should be cleared by about 9 p.m. According to the airport's website, its operated by the Simsbury Flying Club, a non-profit. It has a single 2,205 foot runway. 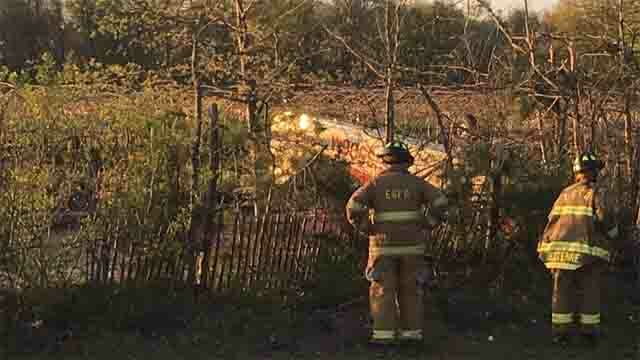 EAST GRANBY, CT (WFSB) - Crews responded to an area near the Simsbury Airport on Wednesday evening for a small plane crash. East Granby police said no injuries were reported to the two passengers, who officials say was a father and son team. The crash was reported just before 7 p.m. as the plane was landing on approach, but landed on the other side of the road. 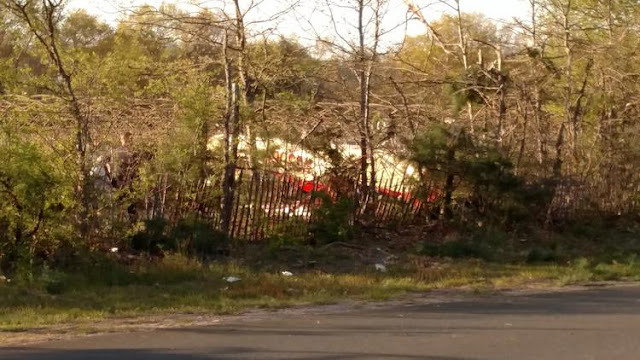 Connecticut State Police said the plane crashed into trees on Wolcott Road in East Granby, which is near the Simsbury Airport. Crews on the scene said the airport is still open. It is unclear what caused the plane to crash. AIRCRAFT ON LANDING, GEAR COLLAPSED, AUSTIN, TEXAS. 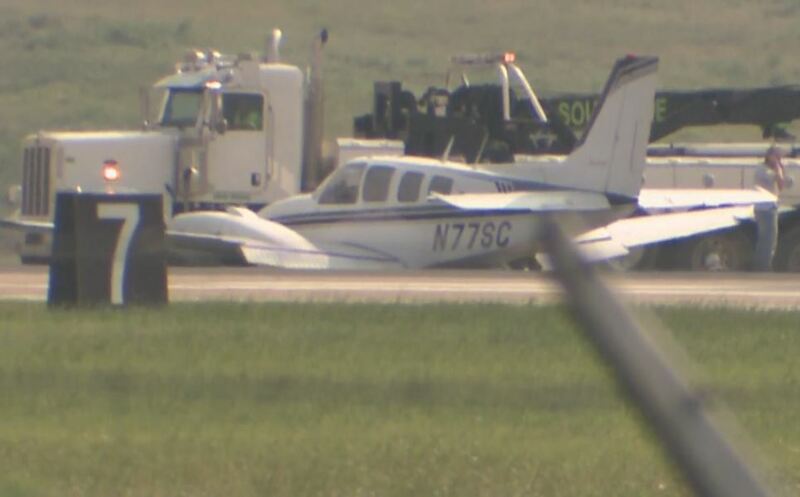 AUSTIN - A small plane landed at Austin-Bergstrom International Airport without its landing gear on Wednesday afternoon, shutting down the airport’s smaller runway. Austin Fire Department said the Beech Baron landed around 4 p.m. Wednesday on the airport’s smaller runway, designated 17L/35R. The pilot of the plane refused treatment. The runway was closed for more than two hours while crews removed the plane. ABIA tweeted that the east runway reopened at 6:25 p.m.
AUSTIN (KXAN) — A plane made an emergency “belly landing” at Austin-Bergstrom International Airport Wednesday afternoon. No one was injured in the incident. The small Beechcraft Baron aircraft landed with its wheels up before 4:00 p.m., triggering a rare “aircraft down” alert. The pilot was the only person on board. The east runway of the airport has been closed until the plane is towed off. ABIA says they can handle all normal operations on their west runway. Dion Flannery is used to blank looks when he talks about the airline he runs. PSA Airlines is not a name-brand carrier most people recognize. But the regional carrier, a wholly owned subsidiary of American Airlines, is a key player in the airline industry, operating hundreds of flights a day at Charlotte Douglas International Airport, where it flies under the American Eagle name. As regional airlines become increasingly important to U.S. air travel, however, they are facing a major problem: finding people to fly their planes. 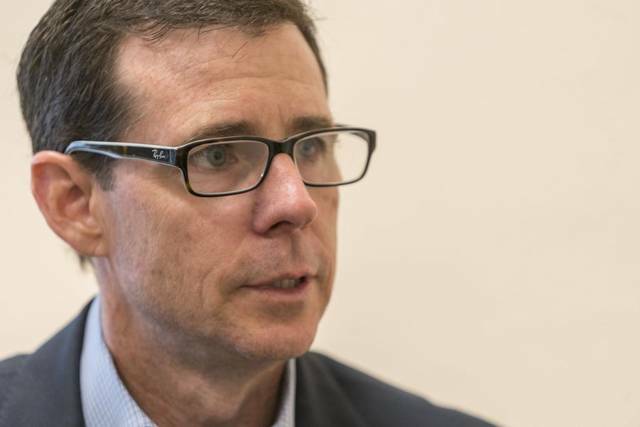 A looming pilot shortage was one of the main concerns on Flannery’s mind this week at a regional airline executives conference held in Charlotte. In February, regional carrier Republic Airways filed for bankruptcy, citing difficulty finding pilots and the resulting grounding of planes as factors in its financial troubles. Regional airlines aren’t generally household names like Delta, American, United and Southwest – PSA, Mesa, SkyWest, anyone? – but they operate about 45 percent of commercial passenger flights in the U.S. They typically fly under contract with the major carriers, operating smaller planes with flight names such as Delta Connection or United Express. At Charlotte Douglas, regional carriers flying for American account for 56 percent of the airline’s daily departures: 370 out of 650 flights a day. PSA operates 260 flights a day at Charlotte for American, and also has 1,100 employees based here. It’s one of 10 regional carriers American uses to fly smaller jets, connecting passengers in small markets with bigger planes in hub cities such as Charlotte. Regulators tightened training requirements for new pilots in the wake of a 2009 accident. A Continental Connection flight operated by Colgan Air crashed on approach to Buffalo, killing 50 people. In response to questions raised about the crew’s experience and response, the federal government increased the number of required flight hours for new commercial pilots. That has increased the cost and time it takes for new pilots to get hired. And while the cost of becoming a pilot, including required flight hours and training, is well north of $100,000, starting first officers at regional airlines typically make salaries in the $20,000s, with the hope of one day moving up to more lucrative assignments at the major carriers. Flannery acknowledged going to flight school and completing all required training is “an enormously expensive endeavor.” He said PSA is increasing pay and adding signing bonuses to entice pilots. The company announced this month that it’s awarding a one-time $20,000 retention bonus to all of its first officers, as well as providing a $250 monthly stipend that they can use to offset the expense of staying in hotels while commuting. The airline has also started a “cadet” program to get aviation students early in their training, offering tuition reimbursement and a path to a job while they’re still in school. PSA plans to hire 500 pilots per year in the coming years. Flannery said regulators should look at training approaches that focus on the quality of flight hours rather than simply requiring all prospective first officers to reach 1,500 hours. “It’s taking longer to train people,” he said. He acknowledged that low starting salaries are an issue, but he said PSA encourages prospective pilots to think of their career in terms of more than the first year. Given the airline’s growth and connection to American, new first officers can get promoted and move up to American in a decade or less. ROMULUS (WWJ) – The case against an American Airlines co-pilot accused of being drunk on the job has been delayed because he’s at a treatment center out-of-state. Speaking at a hearing Wednesday morning in Romulus District Court, John Maguire’s defense attorney Frank Manley explained his client’s absence. Maguire’s blood alcohol level was twice the legal limit as the time of his arrest at Detroit Metro Airport in March. Manley said the 50-year-old Maguire had no history of alcohol abuse leading up to his arrest. However, before proceeding with the case, Manley wants to make sure any potential issues are investigated. “It’s a situation where when anyone is charged with this we want to ensure the best possible defense; we want to make sure there is no problem. If there is one, we want to make sure that it’s taken care of,” Manley said. Manley said it “was a surprise to everyone” when Maguire, a Chadds Ford, Pennsylvania resident, was removed from a Detroit-to-Philadelphia flight before takeoff on suspicion of drunkenness. 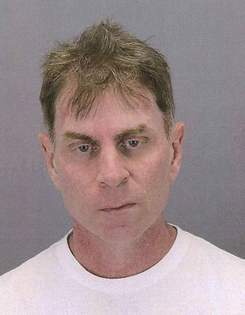 He was arrested and later charged with one count of aircraft – operating under the influence. In comments to reporters following Monday’s hearing, Manley implied he believes his client may return to work as a pilot. “People look at it differently because there’s other people involved, because there’s passengers involved, and we wanna make sure, again, that we do everything possible to protect Captain Maguire’s rights and to protect the public and make sure that they understand that Captain Maguire is safe behind the wheel of a plane,” Manley said. Court proceedings were rescheduled for late June. A project to expand and improve the apron or parking area at the Mexico Memorial Airport is getting off the ground, as the Mexico City Council voted to sign a block grant agreement with the Missouri Department of Transportation to cover engineering work Monday night. Economic Development Director/Assistant City Manager Russell Runge said the expansion is necessary because of increased commercial traffic at the airport in recent years. Runge said the additional space is also needed for the large cargo planes carrying merchandise for area retailers when they stop at the airport to refuel. “We've been needing to do it for a considerable amount of time,” Runge said. The engineering firm providing the work is Crawford, Murphy & Tilly, Inc. Runge said the total cost of the project will depend on the engineering firm's findings, as the amount of clay in the soil and other factors will affect the type of paving work that is ultimately needed to complete the apron improvements. Runge said MoDOT has allocated $76,000 in federal non-primary entitlement funds for the project. Runge said a portion of the $150,000 in block grant money the airport receives from MoDOT each year has been purposely set aside for the past four years in order to bankroll the project. The pilot departed for the seventh of fifteen planned aerial application flights that day; the engine subsequently lost total power. 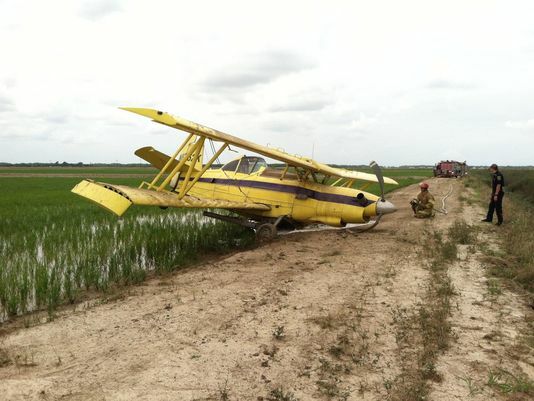 The pilot conducted a forced landing to a rice field. A fuel sample drained from the airplane following the accident was cloudy and contained floating debris. Postaccident examination of the fuel system revealed a significant amount of debris, including grass, leaves, insects, and dirt, in the fuel control filter and airframe filter bowl. Further examination of the fuel filter assembly revealed that the inlet and outlet holes of the filter housing, as well as the filter inlet hose, contained debris of sufficient quantity to result in a disruption of fuel flow to the engine. Whether the pilot conducted a preflight inspection could not be determined; however, a fuel sample taken prior to the flight would likely have displayed contamination. A total loss of engine power due to debris contamination of the fuel system. Contributing to the accident was the pilot's inadequate preflight inspection. On May 11, 2016, about 1400 central daylight time, a Grumman G-164B AgCat airplane, N8362K, made a forced landing in a field near Lyons Point, Louisiana. The commercial rated pilot was not injured and the airplane sustained substantial damage. The airplane was registered to and operated by Vincent Flying Service, Inc., Kaplan, Louisiana, under the provisions of 14 Code of Federal Regulations Part 137 as an aerial application flight. Visual meteorological conditions prevailed at the time of the accident and no flight plan was filed. The local flight had just departed from a private air strip. The pilot reported that he was conducting his seventh aerial application job of the day and this particular job involved fifteen total application loads. On the accident flight he had just departed the private strip which was the seventh load and the airplane had been loaded with about 60 gallons of fuel and the hopper contained about 2,000 lbs of applicant. When the airplane was above the height of a telephone pole (50 to 75 ft) and with no prior indications, the engine experienced a total loss of power and the pilot made a forced landing to a rice field. During the landing roll, the left main landing gear broke and the airplane continued onto a farm road. After the airplane came to rest, smoke was observed from the engine compartment and fuel was leaking from the fuel tanks. The responding Federal Aviation Administration (FAA) inspector reported that there was fuel on the ground near the breached fuel tank and there was corrosion around the fuel tank inlet cap. About 9 gallons of fuel were recovered from the fuel tanks; 7 gallons in the left tank and 2 gallons in the right tank. An examination of the fuel control filter revealed that the fuel was cloudy and contained floating debris. The paper filter was discolored and contained debris. The airframe fuel filter bowl contained a significant amount of debris including leaves, grass, insects, and dirt. The right fuel tank and associated fuel screens were clear of any debris. A review if the airplane maintenance records revealed that an annual inspection was completed on November 1, 2015, and a 100-hour inspection was completed on February 15, 2016. The pilot reported that he was conducting his second aerial application job of the day and this particular job involved fifteen total application loads. On the accident flight he had just departed the private strip which was the seventh load and the airplane had been loaded with about 60 gallons of fuel and the hopper contained about 2,000 lbs of applicant. When the airplane was above the height of a telephone pole (50 to 75 ft) and with no prior indications, the engine experienced a total loss of power and the pilot made a forced landing to a rice field. During the landing roll, the left main landing gear broke and the airplane continued onto a farm road. After the airplane came to rest, smoke was observed from the engine compartment and fuel was leaking from the fuel tanks. On May 11, 2016, about 1530 central daylight time, a Grumman G-164B AgCat airplane, N8362K, made a forced landing in a field near Lyons Point, Louisiana. The pilot was not injured and the airplane sustained substantial damage. The airplane was registered to and operated by Vincent Flying Service, Inc., Kaplan, Louisiana, under the provisions of 14 Code of Federal Regulations Part 137 as an aerial application flight. Visual meteorological conditions prevailed at the time of the accident and no flight plan was filed. The local flight departed from a private air strip at an unknown time. The pilot stated that he was conducting his second aerial application flight of the day and this particular job involved fifteen total spray passes. On the accident flight he had just completed the seventh spray pass and was above the height of a telephone pole (50-75 ft). The fuel tank contained 55-60 gallons of fuel and the hopper contained about 2,100 lbs of application. Without warning, the engine experienced a total loss of power and the pilot made a forced landing to a rice field. During the landing roll, the left main landing gear collapsed and the airplane continued onto a farm road. After the airplane came to rest, smoke was observed from the engine compartment and fuel was leaking from the fuel tanks. The airplane had not experienced any anomalies prior to the accident. The Acadia Parish Sheriff’s Office is currently on scene in the Lyons Point area in response to an emergency landing of a crop duster. Deputies and local fire departments are on scene. According to the flight instructor, during the landing roll, two deer ran on to the runway. He reported that the airplane struck one of the deer, exited the right side of the runway and nosed over. The airplane sustained substantial damage to vertical stabilizer and rudder. The flight instructor reported that there were not any pre-accident mechanical failures or anomalies with the airplane that would have precluded normal operation prior to the accident. The pilot did not submit the 6120 Report of Aircraft accident Form as requested by the investigator. The comments section of the FAA Airport Facilities Directory for the accident airport includes the comment: WILDLIFE ON & INVOF (in vicinity of) ARPT. The airplane striking a deer during the landing roll, resulting in a loss of directional control, runway excursion, and subsequent nose over. 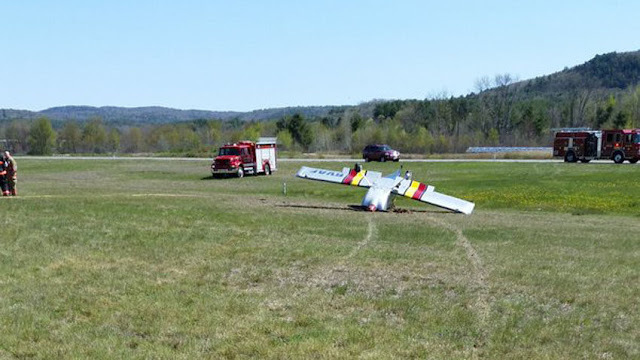 NORTH SWANZEY - A deer-versus-aircraft crash at Keene Dillant Hopkins Airport is under investigation by the Federal Aviation Administration and the New Hampshire Department of Transportation's Bureau of Aeronautics, Swanzey Fire Chief Norm Skantze said Wednesday afternoon. Located in Swanzey, the airport is owned and run by the neighboring city of Keene, Skantze said, so both Swanzey and Keene fire departments share responsibility for the small airport. Skantze said he was called to the airport at 9:39 a.m. Wednesday by a Southwest Mutual Aid dispatcher and found Keene Fire Chief Mark Howard already on the scene. 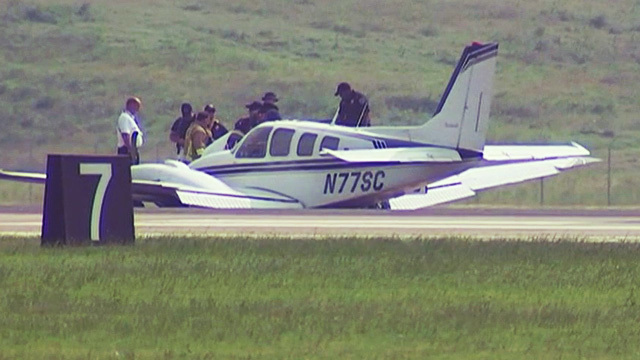 The aircraft had two occupants who were able to get out of the plane unassisted, Skantze said. The deer was not as fortunate and died as a result of the impact, according to the Swanzey chief. The runway was closed for only a short time. Federal and state investigations continue, Skantze said. An airport official referred questions to the FAA, which responded in the afternoon with a statement. 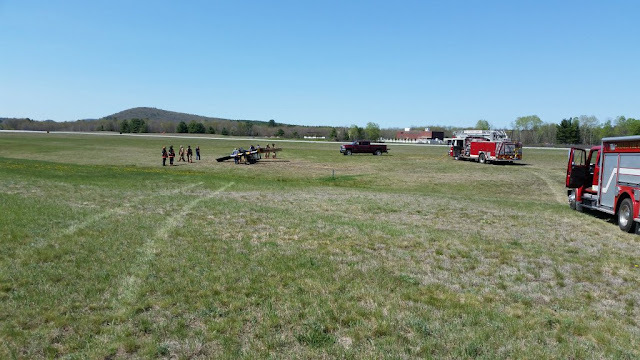 “A Vans RV-8 aircraft went off the side on Runway 2 and flipped over after it struck a deer as it was landing at Dillant-Hopkins Airport in Keene, NH at about 9:45 am today. … The aircraft departed from Boire Field in Nashua. The FAA will investigate,” the FAA said. Skantze said he could not reveal the details about the occupants or the airplane while the investigation is underway. He was able to give a summary of the crash. “The plane was attempting a routine landing and as it was just coming down on the runway a deer came out on the runway and the plane hit it and forced the plane onto a grassy area where the plane rolled over,” Skantze said. The chief couldn't recall a crash involving wildlife in the past, but said it is not unanticipated by pilots. Firefighters had responded to the airport just a few weeks ago for a minor crash believed to have been caused by cross-winds. NORTH SWANZEY — A small plane and a deer collided at the Dilliant-Hopkins Airport this morning. The occupants of the plane were not injured, according to the Keene Fire Department's Twitter feed, but the crash closed the main runway at the Keene-owned airport off Route 32. The plane was landing when it hit the deer, which caused the aircraft to leave the runway and overturn, Keene fire officials said. Both people in the aircraft were able to get out safety, fire officials said. The crash was reported just after 9:30 a.m., and besides the Keene Fire Department, members of the Swanzey Fire Department and DiLuzio Ambulance Service responded. Airport Manager John G. “Jack” Wozmak declined comment at the scene, referring all questions about the incident to the Federal Aviation Administration. This is the second plane crash at the airport in about two weeks. On April 30, a single-engine recreational aircraft was coming in for a landing when it was caught by a crosswind and went off the runway. No injuries were reported, but the plane and at least five lights along the runway were damaged. KEENE, N.H. (AP) — Authorities say a small plane has struck a deer and flipped over while trying to land at a New Hampshire airport. WMUR-TV reports that two people were aboard the plane and were able to get out safely Wednesday morning. The main runway at Keene Dillant-Hopkins Airport was closed while officials investigated. The airport property takes up about 1,000 acres and is surrounded by trees. The airport has two runways. The airport’s manager and the Keene Fire Department didn’t immediately return phone messages seeking comment. Boeing Co. said Wednesday that it would deliver the first of its revamped single-aisle jets ahead of schedule, reflecting its progress testing the more-efficient workhorse aircraft. 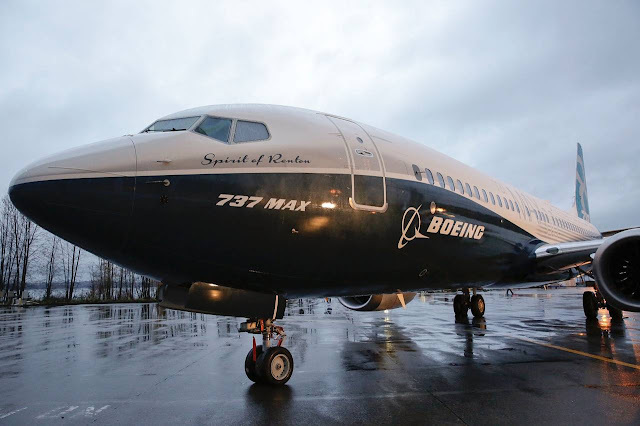 Ray Conner, chief executive of Boeing’s Commercial Airplane unit, told analysts at its annual investor conference that Boeing would deliver the first 737 Max to Southwest Airlines Co. in the first half of 2017, having previously targeted the third quarter of 2017. Mr. Conner said the company has completed more than 400 hours of aerial tests on the 737 Max, which features new CFM International engines and aerodynamic improvements to provide 14% better fuel efficiency compared with existing jets. Boeing holds nearly 3,100 orders for the new 737 Max. AIRCRAFT, JAVRON REPLICA PA18, WITH FLOATS, ON LANDING ON THE LAKE, FLIPPED OVER, LAKE JORDAN, KETCHIKAN, ALASKA. The Ketchikan Volunteer Rescue Squad and a Temsco Helicopter responded to the scene of a float plane crash in the Ketchikan area after Alaska State Troopers received multiple calls shortly after 2 pm on Tuesday reporting the incident. Callers reported the float plane accident 20 miles to the north of Ketchikan at Jordan Lake. When arriving at the area, rescuers found that the pilot, identified as 58-year-old Billy Rusk of Poplar Grove, “was cold and wet, but otherwise unhurt,” the trooper dispatch reported. Rusk was transported from the lake to nearby Heckman cabin, on Heckman Lake, a more accessible location, “where KVRS aircraft and medics were standing by.” The KVRS aircraft transported Rusk to Ketchikan, where he refused further transport to the hospital and reported no injuries. The trooper dispatch reports that Rusk’s aircraft remains at the lake and will be retrieved later by Rusk. The National Transportation Safety Board was notified of the incident. ANCHORAGE (KTUU) The pilot of a float plane was rescued after it crashed into a lake north of Ketchikan, Tuesday afternoon, Alaska State Troopers wrote in a dispatch Wednesday. At about 2:19 p.m., multiple people reported to Alaska State Troopers that a float plane had crashed into Jordan Lake, 20 miles north of Ketchikan. "Preliminary investigation revealed that the pilot and sole occupant Billy Rusk, age 58, from Poplar Grove, IL was not injured," troopers wrote. The Ketchikan Volunteer Rescue Squad and a Temsco helicopter responded to the lake and rescued the pilot who was not injured in the crash. "The pilot was transported to nearby Heckman cabin where KVRS aircraft and medics were standing by," troopers wrote. "KVRS transported the pilot to Ketchikan where he refused transport to the hospital and reported no injuries." The plane remains in the lake and will be recovered by the owner. The National Transportation Safety Board was notified of the crash. AIRCRAFT ON LANDING WENT OFF THE RUNWAY INTO THE GRASS, TAMPA, FLORIDA. AIRCRAFT LANDED GEAR UP, DENTON, TEXAS. The pilot stated that, during the takeoff roll, the airplane veered to the left and he then reduced engine power and applied full right rudder to correct. The airplane exited the runway and struck airport lighting, resulting in substantial damage. The pilot indicated a crosswind of about nine knots was reported about the time of the takeoff. Postaccident examination of the nose landing gear assembly revealed that the bolt that attached the nose landing gear retraction link to the nose gear truss assembly was missing. The bolt holes were intact and not deformed, consistent with the bolt exiting the holes because the nut was no longer retaining the bolt, rather than the bolt shearing in place. According to the manufacturer, it was possible that without the bolt, the nose wheel could be allowed to turn suddenly, and that the pilot's steering inputs would be ineffective. The investigation could not determine where or when the bolt was liberated from the nose landing gear. A missing bolt in the nose landing gear assembly, which resulted in the airplane suddenly turning left and the pilot's inability to maintain directional control during a crosswind takeoff. 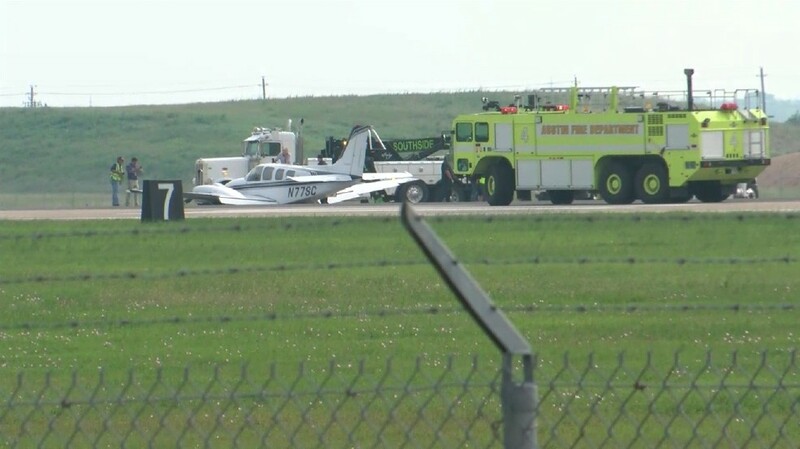 On May 10, 2016, about 1500 eastern daylight time, a Mooney Aircraft Corp. M20K airplane, N57535, was substantially damaged during a runway excursion during takeoff on runway 19 at the Akron-Canton Regional Airport (CAK), near Akron, Ohio. The pilot and two passengers were not injured. The airplane was registered to Collier Aviation LLC and was operated by the pilot under the provisions of 14 Code of Federal Regulations Part 91 as a personal flight. Day visual meteorological conditions prevailed for the flight, which was not operated on a flight plan. The local flight was originating from CAK at the time of the accident. According to the pilot, the airplane veered to the left during the takeoff roll as the airplane accelerated to takeoff speed. He reduced engine power and applied full right rudder. The airplane exited the runway and struck airport lighting where it sustained substantial wing and fuselage damage. At 1351, the recorded weather at CAK was: Wind 100 degrees at 9 knots; visibility 8 statute miles; sky condition scattered clouds 6,500 feet, broken clouds 10,000, broken clouds 22,000 feet; temperature 19 degrees C; dew point 13 degrees C; altimeter 30.10 inches of mercury. A Federal Aviation Administration inspector examined the airplane wreckage. An inspection and operational check of the nose wheel steering and brake system was conducted with no mechanical defects found. However, during the inspection of the nose wheel well area, a missing bolt was discovered, which attaches the nose landing gear retraction link to the nose gear truss assembly. The brake system was also inspected and appeared to be functioning properly. The airplane manufacturer's safety representative was asked if the missing bolt would cause the nose wheel to castor into the wind on a takeoff roll and he indicated that he did not believe it would allow the wheel to castor if the bolt fell out. The steering/rudder push pull rods should prevent the wheel from moving either direction, but it is possible with that one element missing to cause a sudden turn of the nose wheel. The manufacturer's illustrated parts catalogue was reviewed and the missing bolt specification indicated it was an AN6-14A bolt. The missing nut specification indicated it was an AN363-624 nut. The AN6-14A bolt is a 3/8 inch and 24 thread-per-inch pitch bolt with an undrilled shank. The AN363-624 nut is a 3/8 inch and 24 thread-per-inch pitch metal stop nut. A review of photos of the holes associated with this bolt revealed that the holes were circular and were not deformed or oval shaped. Airport operations personnel swept the runway and taxiway with brooms after the incident and they did not find any loose bolts. The investigation could not determine where or when the bolt was liberated from its nose landing gear. On May 10, 2016, about 1400 central daylight time, a Mooney Aircraft Corp. M20K airplane, N57535, was substantially damaged during a runway excursion during takeoff on runway 19 at the Akron-Canton Regional Airport (CAK), near Akron, Ohio. The pilot and two passengers were not injured. The airplane was registered to Collier Aviation LLC and was operated by the pilot under the provisions of 14 Code of Federal Regulations Part 91 as a personal flight. Day visual meteorological conditions prevailed for the flight, which was not operated on a flight plan. The local flight was originating from CAK at the time of the accident. 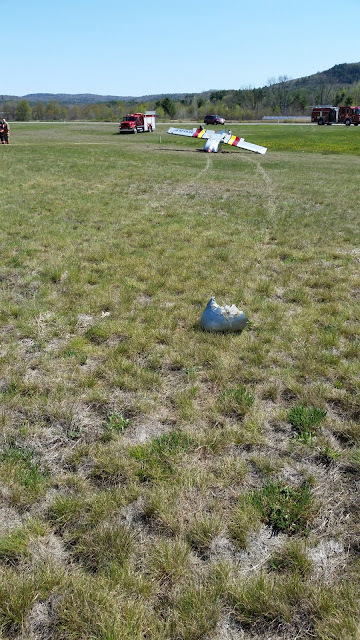 During an initial interview, the pilot reported that the airplane veered to the left during the takeoff roll, exited the runway, and struck airport lighting where it sustained substantial damage. OTHER EQUIPMENT: Garmin GMA-340 Audio Panel, Garmin GNS 530, Garmin GNS 430, Garmin GTX 327 Transponder, Insight SF-2000 Strikefinder, Century 41 Autopilot, EDM 800 Engine Monitor, Hoskins FT 101 Fuel Flow Indicator. DESCRIPTION OF ACCIDENT: Exterior fire during attempted engine start; fire spread into right side of interior. DESCRIPTION OF DAMAGES: Moderate soot covering right side cowl & wing root; Fire damages to right front & rear seat & right side carpet; fire damage to right door inside trim;side windows broken out by fire department; headliner removed by fire personnel; baggage door skin cut by fire personnel; dry chemical fire extinguishing agent and foam sprayed into interior and instrument panel; instrument panel and avionics have streaks from foam & dry chemical running down panel face. AIRCRAFT WHILE ON RAMP, ENGINE CAUGHT FIRE, EXTINGUISHED, NO INJURIES, SANTA ANA, CALIFORNIA. AMERICAN AIRLINES FLIGHT AAL423 AIRBUS A321 AIRCRAFT, REGISTRATION NOT REPORTED, SHORTLY AFTER DEPARTURE, STRUCK BIRDS, RETURNED AND LANDED WITHOUT INCIDENT, NO INJURIES, SUBSTANTIAL DAMAGE TO FUSELAGE UNDER WINDSHIELD, PHOENIX, ARIZONA. The pilot reported that he bounced once during the landing touchdown in crosswind conditions, and subsequently ground looped to the left. During the ground loop, the right main landing gear collapsed and the right wing was substantially damaged when it impacted the runway. An automated weather observing system, about the time of the accident, reported the wind at 080 degrees true at 14 knots, for the landing on runway 17 left. The pilot's failure to maintain directional control during the landing roll in crosswind conditions, which resulted in a ground loop and substantial damage to the right wing.